Achieving a European architectural style in an American home can be enhanced through an old world door – creating an elegant and distinctive entryway. The door or entryway generates the first impression of a home and immediately conveys much about the dwelling and its owners. Whether ornamental in style or solid with a distinct simplicity in its construction, an old world door is a reflection of the homeowner’s lifestyle – rich with textures such as wood, iron, stone and glass. Decorative in style without excess or eccentricities in the details, an old world door links different architectural elements of a home’s façade and creates a focal point symbolizing secure privacy and access or entry into private areas of a home. In the 17th century, custom designs in old world doors became central to establishing a unique façade that communicated the resident’s wealth and social standing. An old world door may be characterized with features reflective of a period – adorned with Grecian motifs such as triglyphs, canals and drops, arabesques and foliation, garlands and acanthus from the neo-classicism style introduced in the second half of the 18th century. Combined with architectural elements such as pilasters resting on pedestals, an old world door establishes a dignified home. 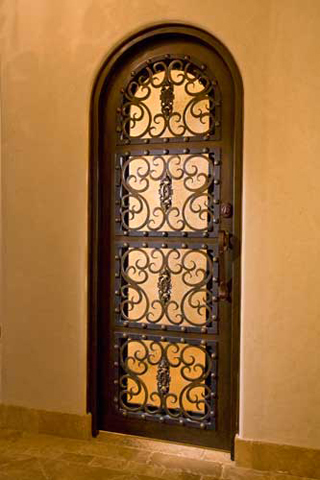 Custom ironworks sets the entry door apart from any other and conveys originality. Ornamental details – from wrought iron elements and overdoor windows to iron door knockers and stone sculptures of feminine figures or animal heads create a dramatic feeling of opulence in an old world door. A home’s stone façade combined with an old world door – characterized by sound structure and architectural details that a visitor expects will continue in the home’s exterior and interior design – creates a rich environment and impression of comfort. A uniquely designed entry door captures the past and creates the essence of luxury in today’s modern world.